This wreck is another like the C-46 where Id been to the site many years previously and well before Id gotten obsessive about finding wreck sites. In 1984, when my Jeep Cherokee was brand-new, I worked in a technical support position for a major computer manufacturer. I worked with a wonderful fellow named Bill Marr. Bill offered to lead a trail ride or two for the purpose of teaching me how to go four-wheeling and to entertain company support folks during a day off after a worldwide conference/training session. Bill was driving a 1984 Ford Bronco II at the time. We had a road trip with guys from Sweden, Israel, Italy and several parts of the US which took us from Ft. Collins, down to Denver, west on I-70 to Dillon then south and back east toward Webster Pass. This is marvelous & spectacular country for off-roading because it has incredible views and some amazing roads to travel. One branch road to the south, just on the west side of Webster Pass switches thru the tailings piles of an old mine before it traverses across the hill and then turns steeply upwards along the nose of the ridge to the top. Bill led us to the mine area where most of us parked but he went ahead and drove on up to the top of the ridge and then back down. I clearly recall the shaky voice of the fellow from Sweden asking "this has dual braking system, yah?" 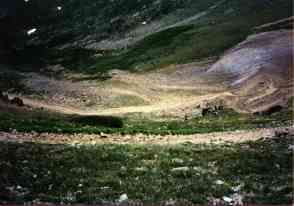 as we were pointed down a startlingly steep hill on return. As we neared the tailings pile Bill mention that if we looked along the side of the road we could see airplane parts. He said an airplane had crashed here during WWII and that there used to be more. 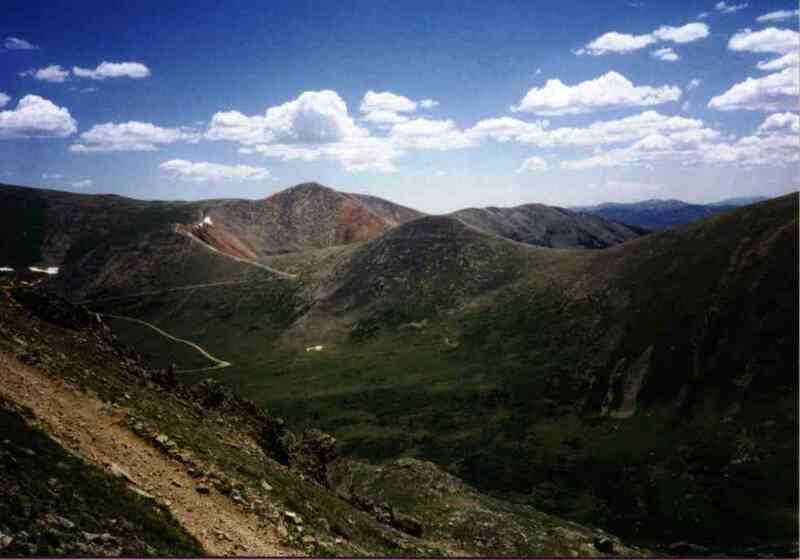 I recall spending some time visualizing the plight of a scud-running DC-3 here at 12,000 cresting the pass and turning the wrong way down the valley and being dead-ended and crashing here at the mine. Then I forgot about that image for about 12 years. After plotting the CAP list coordinates I recognized that I had been there and I knew exactly where that wreck really was. So, one Saturday I made the trip in my Jeep. 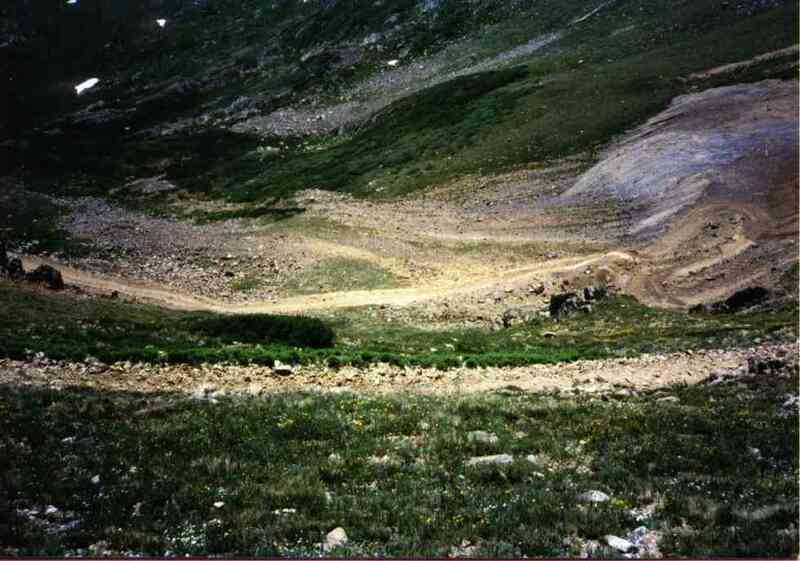 I found that I could remember how to get there perfectly well but that the 4WD road below the mine had deteriorated to such an extent that I didnt want to abuse my stock Cherokee by trying to force it to go up the rutted, bouldery road. So I parked it and walked the 1/4 mile to the site. I spent several hours looking over the area including climbing the hillside above the mine and the creek/snowmelt channels below the mine. I found airplane evidence quite high up on the hill but the scraps were the size of ones fingernails. There were a few bigger pieces, say the size of a paperback book, down in the meltwater channel but by-and-large, the airplane had been totally removed. After the trip Duke was able to come up with a news clipping stating that the AF had lost a jet in that area and F-94 was no typo. It was a transitional aircraft in the F-80 "Shooting Star" series and had a rather unique arrangement of rockets loaded in an annular ring around the nose for firing into Soviet bomber formations . We still dont know very much about why it came down. Aluminum chips frome here all the way down. 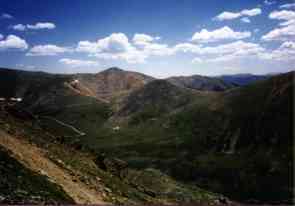 Webster Pass across the valley to the NE.